Laura Ottaviano...Port Charlotte, "Putter's Palace", Gabriel's Rest". "We're very pleased with the web site". 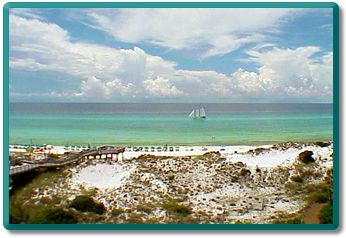 Ann Day... Perdido Key, "Seagull's Paradise"
Hi Dave, I just wanted to let you know that we will no longer be using a web page to rent with. We have decided that we will use it ourselves for the winters now. Your site was awesome and I had only wished I didn't waste all that time with rental companies. That was a big mistake. Your help along the way with developing my page and calendar was great. Best wishes for continued success, and I will definitely tell everyone about your website. Thank you, Joan Radocchio... Englewood, "Relaxation Station" (page now off-line). "Dave, I've only been a customer since mid December, but already I can tell you that 100% of enquiries have come form your site (I've had none from *RB*) and that your enquiries, follow on to book most of the time. So thanks! Your fee was the best I've ever spent." Andrea Tushingham, Rotonda, Palm Villa"
Dave, thanks to your web site, we were able to land a last minute rental for 3 months. We did not join your website until November and thought we were out of luck. We had more inquiries from your web site than our real estate agent. Thanks. Larry Roberts, Naples, "Serenity in Sunny Naples". Hi Dave, thanks to you I have enjoyed as good a return from my advert over the last year that I could hope for. I do believe you are one of, if not, the best place to advertise a gulf coast villa....Karen Johnson, Diamond Delight in Rotonda West. Hi Dave, First, I'd like to say that in the two years that we've worked with you, the results have been wonderful. We advertise on about four sites and your site brings in about 80% or more of our bookings. Thank you for your service!!! Dave, thank you for the quick work on the new Gabriel's Rest ad. Three hits on the first day it was up! Laura Ottaviano...Port Charlotte, "Gabriel's Rest", "Putter's Paradise". Dave - we had several "hits" & have received rentals last winter too! Thanks! Cindy Blasa...Englewood, "Blasa's Island Retreat". Kathy Bergren...St Petersburg, "Spectacular Sunsets". Hello David, your site is amazing. I have the house booked for a little over 3 months year! Almost enough to pay for half of the yearly expenses! Karen R. Johnson.. Rotonda, "Caryn's Castle". Dave, Thanks for getting the Calendar posted. I've got to tell you that within 2 hours of posting my property on your web site, I got an inquiry that turned into a three week rental totaling $3,750. Your web site paid for itself for the next 20 years. Many thanks. Vic Di Tommaso... Anna Maria Island, "The Penthouse"
Jim Connelly...Santa Rosa Beach, "Calypso Cottage" and 18 other properties! "Very good results from Gulfcoast"
Al Bottino...Marco Island, "Sunset Terrace"
Thank you for your "quick action" on the ad. We have had great response. Virginia Bannister...North Captiva Island, "Big Beach House" & "Little Beach House"
Barbara & Eddie Davis...Destin, "Paradise View", "Scuba/Snorkel Destin"
"Thanks for the great work. Getting great results." Ed Lyon...Aligator Point, "White Pelican"
"I advertise on 7 sites. The volume I get off this page is twice the other 6 put together. Keep up the good work!" "within 3 days of my ad appearing on the Gulf Coast Rental site I got a rental so I am pleased." Thanks, We are getting great results with our site through you. (312) days booked for this year! Thanks again, Rita E., Indian Shores, "Dolphin Haven". Thanks so much.... It looks great! Can't tell you how great this site is. The new listing looks great and I've already had 3 inquiries and 1 rental in just the first day! Kim Johnson, Ft Walton Beach, "Beach Bliss", "Paradise Found", "Emerald View"
AB Hollowell, Gulf Shores, "Beach Walk", "Beach Walk North" & "Kalan's Kottage". Myles & Penny Milligan, Sarasota, "Birdies & Eagles"
Thanks for your great site. You rank #1 in referrals of the three condo ad sites that I use. John Weitz, Cedar Key, "Jigger John's Joint"
Hi Dave, Thought you'd like to know that your website continues to produce strong leads. I'm not going to renew my listing with ********** because I get so few inquiries and none of them have resulted in a rental. My two strongest sites are Gulf Coast Rentals and ***********.com. Rhonda Peters, Englewood... "The Perfect Spot"
Founded in '97, we are a regionally focused site for the private owner / small investor. We currently advertise more than 1300 properties on or near the Gulf Coast, from Texas to the Florida Keys and now including Florida's East Coast! We average between 40 and 60 thousand visitors per week. Our semi-custom web pages and user-friendly directories give us a look and feel found in no other web site. Your property is special and it's our job to represent it in the best way possible! * Your pictures are processed in Photoshop 7... leveled, adjusted for brightness & contrast and receive a color frame & drop shadow for best appearance. * A custom city header and property name header add personality to your unique and colorful advertisement. * A detailed description in the appropriate City Directory is linked to the Internet web page we have created for you. * Free, easy-to-use EZCal Calendar...or we will link to your Calendar. * Advertise specials, cancellations etc. in your City Directory. * Additional pictures at low rates with Fast, Friendly Service !